This romantic Mosaic adventure game follows a young American journalist in her travels through Italy in search for a mysterious friend. Hoping she will meet him at last, she enjoys Italian summer. On her journey she follows clues which take her to different parts of sunny Italy. She discovers the rich Italian culture and takes pleasure in delicious Italian cuisine. Learn about the Italian culture by getting diverse souvenirs and completing Minigames that tell you how to cook pasta and make pizza. Decorate a strawberry cake and a gelato glass cup. Restore ancient mosaics. Color masterpieces of grand masters of the Italian Renaissance. Discover hidden herbs and spices in the grass. Choose your own level of challenge with or without time limitation. 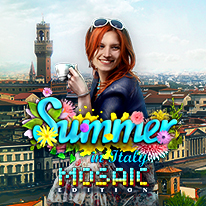 Play over 100 Mosaic levels and enjoy various Minigames through four chapters in the Italian summer sun.